Eric Whitacre is one of today’s most popular and frequently-performed composers. His remarkable global appeal has been enhanced by his achievements as a conductor, innovator, broadcaster, and charismatic public speaker, and by the best-selling success of his recordings. A graduate of the prestigious Juilliard School of Music, Eric was recently appointed Artist-in-Residence with the Los Angeles Master Chorale having completed a five-year term as Composer-in-Residence at Sidney Sussex College, Cambridge University, UK. In addition to his extensive output for choir and vocal ensemble, Eric’s orchestral works have been performed by some of the world’s most distinguished orchestras on both sides of the Atlantic. Eric’s first album as composer and conductor, released by Decca as Light & Gold, won the 2012 Grammy® Award for Best Choral Recording. The recording reaped a harvest of five-star reviews and topped the U.S. and U.K. classical album charts within a week of its release. His second album for Decca, Water Night, secured the No.1 position in the iTunes and Billboard classical charts on the day of its release in April 2012. Water Night includes seven world premiere recordings performed by the Eric Whitacre Singers – the composer’s U.K.-based professional choir – and the London Symphony Orchestra, Julian Lloyd Webber, and Hila Plitmann. Eric’s first vinyl EP was released in 2013, featuring his choral arrangement of Depeche Mode’s Enjoy the Silence. Artists from around the world have recorded Eric’s original compositions, bringing his work to the attention of a global audience. The range of Eric Whitacre’s international reach increased in 2010 with the launch of his ground-breaking Virtual Choir, Lux Aurumque. The online project, inspired by a young singer’s video upload, was created by 185 singers from a dozen different countries. Within two months their joint recording attracted over a million views on YouTube and has now been viewed over four million times. The project grew in numbers with Virtual Choir 2.0, Sleep, and Virtual Choir 3, Water Night, Virtual Choir 4 Fly to Paradise receiving over 8,400 submissions from 101 countries. Released in July 2013, the film was launched as part of the Coronation Festival at Buckingham Palace and televised on BBC 1. To date, the four Virtual Choirs have registered over 15 million views. Recent Virtual Choir projects include Glow written for the Winter Dreams holiday show at Disneyland© Adventure Park, California, and the Virtual Youth Choir, in association with UNICEF, which premiered at the Glasgow 2014 Commonwealth Games. Born in Nevada, Eric joined a marching band at school and also played in a techno-pop group. His musical passions broadened and deepened during his years as a student at the University of Nevada, Las Vegas, inspired above all by the life-changing experience of singing Mozart’s Requiem. Eric completed his first choral composition, Go, lovely rose, in 1990 as a gift for David Weller, his college choral director. The piece and two companions were published as Three Flower Songs. Eric subsequently studied composition with John Corigliano and David Diamond at the Juilliard School in New York, graduating as Master of Music in 1997. His early output for choir and symphonic wind ensemble was well received by critics in the United States and eagerly taken up by performers; meanwhile, news of his music’s luminous beauty and harmonic richness swiftly spread overseas. Many of Eric’s works have entered the core choral and symphonic repertories and have become the subject of scholarly works and doctoral dissertations. He has received composition awards from the Barlow International Composition Competition, the American Choral Directors Association (ACDA), and the American Composers Forum. In 2001 Eric became the youngest recipient of the ACDA’s coveted Raymond C. Brock commission, an outstanding achievement for a composer who discovered classical music relatively late in life. His list of works includes prestigious commissions for, among others, the BBC Proms, the London Symphony Orchestra and Chorus, Chanticleer, Julian Lloyd Webber and the Philharmonia Orchestra, The Tallis Scholars, the Berlin Rundfunkchor, and The King’s Singers. His musical, Paradise Lost, won both the ASCAP Harold Arlen award and the Richard Rodgers Award, and earned 10 nominations at the Los Angeles Stage Alliance Ovation Awards. Eric’s versatility is also reflected in his collaboration with legendary film composer, Hans Zimmer, with whom he co-wrote the ‘Mermaid Theme’ for Pirates of the Caribbean: On Stranger Tides. 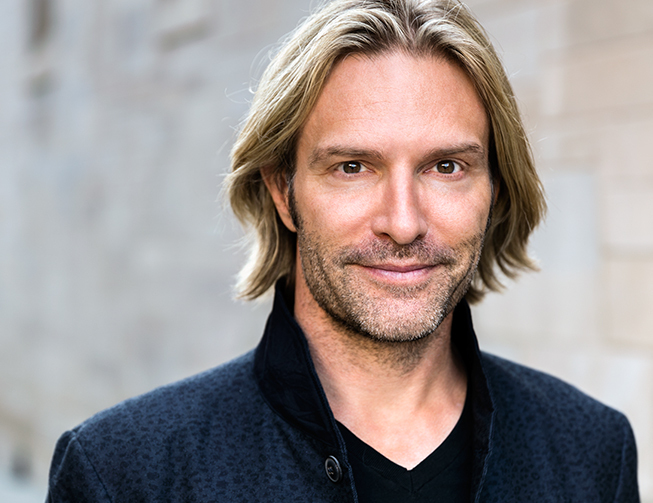 As a natural and persuasive orator, Eric Whitacre has been invited to address the UN Leaders Programme and to speak for UNICEF and Google amongst others. He has appeared twice on the main stage at the hugely influential TED conference in Long Beach, CA, earning standing ovations on both occasions; his 2011 TEDWeekend talk, co-hosted by TED and The Huffington Post, was among the most popular in the event’s history. In recent years he has addressed audiences worldwide at leading universities, the Economist, Seoul Digital Forum and other high-profile global institutions. In October 2012 Eric presented his Virtual Choir at the F.ounders conference, an annual private gathering for 150 of the world’s leading technology company founders, and participated in a discussion with YouTube co-founder Jawed Karim. Eric was invited to the World Economic Forum in Davos in January 2013, where he led a debate on the role of arts in society and the impact of technology on the arts and gave a presentation to the closing session. He addressed the 2013 Ciudad de las Ideas “Brilliant Minds” conference, a celebration of the most provocative and innovative ideas in science, business and culture. His work as a creative and cultural leader has also been recognized with an Honorary Patronage from Trinity College Philosophical Society, Dublin, and the award of Alumnus of the Year 2012 by the University of Nevada, Las Vegas. The range of Eric’s work crosses the conventional boundaries set for different musical genres. His open-minded, compassionate approach acknowledges music’s extraordinary capacity to unite people from all backgrounds. Broadcast live to 119 countries worldwide, Eric made his iTunes Festival debut with his professional choir in 2014, inviting multi award-winning composer and conductor Hans Zimmer to the stage for a new choral arrangement of Time. Over recent years, Eric has collaborated with British soul artist Laura Mvula, Annie Lennox, composer Jeff Beal of House of Cards fame, accordionist Ksenija Sidorova, and Norwegian singer-songwriter Marius Beck. In 2011 Eric served on the jury of the Abbey Road 80th Anniversary Anthem Competition and conducted the London Symphony Orchestra and Eric Whitacre Singers in recordings of the winning entries at Abbey Road Studio 1. He and his choir shared the stage with renowned singer-songwriter Annie Lennox and the London African Gospel Choir at London’s Guildhall in May 2013, performing as part of the ceremonial presentation of the 2013 Templeton Prize to Archbishop Desmond Tutu and was invited to return to perform in 2014. In June 2014, Eric took to the stage of the Kennedy Center for a live webcast and consequently conducted a massed choir of 400 singers on the Mall, Washington D.C. in celebration of Flag Day and the 200th anniversary of The Star-Spangled Banner. Eric currently lives in L.A. with his wife, Grammy© award-winning soprano Hila Plitmann, and his son.